I ran track all throughout high school but actually didn’t get involved with a club until grade 11. I played a bunch of team sports growing up as a kid but in the middle of high school I wanted to focus on just one sport and track was the one that stuck. Growing up and starting the sport in Ontario, you had a different start compared to others in our region. How does the sport culture in Ontario compare and contrast with that of Nova Scotia? I find the culture you are a part of very much depends on the people you surround yourself with. I’ve been lucky to work with very dedicated coaches and ambitious teammates in both provinces. Although different, I have enjoyed my experience in both places and have found they have both shaped me as an athlete. What were some of the highlights of competing in OFSAA? My best OFSAA was probably in my midget year. It was my first year running and I was very much a small fish in a big pond. I managed to finish 4thagainst a lot of girls that had been running for years. It was definitely a shock, and the first year that I really enjoyed running. After graduating fromBill Crothers Secondary School in Ontario in 2016, you enrolled in the Bachelor of Commerce program at Dalhousie University in Halifax. What made you choose to attend Dalhousie? I really wanted to attend Dalhousie because I loved the idea of being on the east coast. Dal always stuck out to me because of the beautiful campus that was right in the middle of the city. My program also has three mandatory co-op positions, which I thought would be really valuable. Despite being the AUS record holder and the back-to-back reigning champion in the event, you chose not to contest the 60mh at this year’s AUS Track and Field Championships. What made you choose not to race the hurdles this season? My coach and I decided that I had a better chance at doing well in the 60m if I took out hurdles and focused more on speed. Perhaps to replace the hurdling, you contested the 300m for the first time this year, capturing silver at the AUS Championships. The event is of course much longer than your primary events; how did you find racing the distance to be? I actually really loved it. The practices are definitely harder but I’m hoping that it will translate to a better 200m this summer. Can we expect to see you add the 300m to your main events? In our interview with teammate Hudson Grimshaw-Surette two weeks ago, we talked about the unusually stiff competition Dalhousie faced in the relay events at this year’s championships. As a member of the 4x200m and 4x400m teams, take us through the relay events. From your university experience to date, does the depth of the relay events appear to be increasing at the AUS Championships? The relay events were so fun to watch on both the men’s and women’s side. Relays are my favourite part of any track meet because I find it brings everyone together. I think that the depth of the relays has been increasing throughout my years. There is no doubt, increasing the depth in the AUS conference is good for everyone. Having tough competition pushes our team to work that much harder. 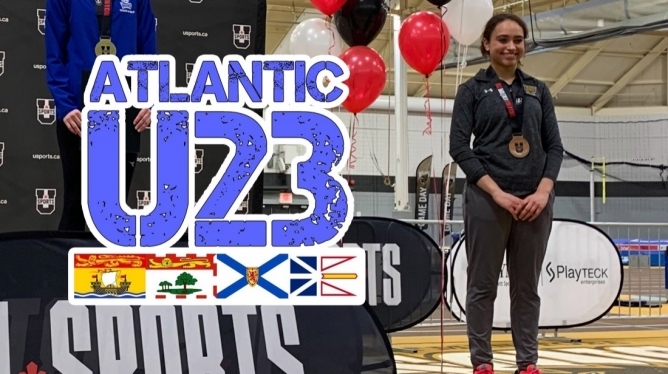 Undoubtedly the highlight of your indoor season happened just last weekend at the U SPORTS Track and Field Championships in Winnipeg, where you set a big personal best to win bronze in the event. From prelims to finals, take us through your U SPORTS experience. I remember waking up that day and just being ready to race. The race was at night, so it was the only thing I thought about the entire day. I was in the right headspace and my body felt rested and healthy. It was after my prelims that I thought I had a chance at medaling. I had run a best time and still felt like I could’ve gone faster. I think it was a combination of the right mindset and feeling rested going into the final that allowed me to medal. Dalhousie Sprints Coach Mike Bawol has made a name for himself in working with top talent in the Maritimes, training national success in yourself, Matt Coolen, Josh Lunda, Mike van der Poel, and many others. Academically and athletically, take us through a typical day in the life of a Dalhousie sprinter. Our days are pretty standard. I usually have 2-3 classes per day and then practice at 5:30pm. You’ve competed at the U SPORTS Championships in each of your three years at Dalhousie. What does a week of workouts typically look like for you in the build-up to a national championships? The week before meets are usually the most relaxing. We focus a lot on having low stress and a lot of sleep. We usually do a few speed practices and starts, but nothing too intense. With the indoor season having just finished, I’m sure you are mostly taking a well-earned break from track right now, but do you have any goals or big plans for the upcoming outdoor season? My goals for this season are to run PBs in the 100m and 200m. I think as long as I stay healthy this season I’ll be happy. Anything that involves hanging out with my friends is how I spend my downtime.